The Bartlett School of Architecture, contractors Gilbert-Ash (GA), architects Hawkins\Brown and UCL last week celebrated reaching a significant milestone in the refurbishment of 22 Gordon Street (formerly Wates House) with a topping out ceremony. 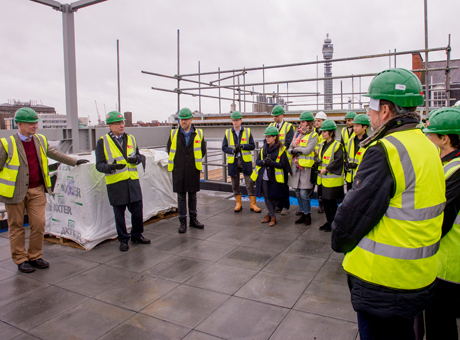 Held on the roof of 22 Gordon Street on 27 January 2016, the topping out ceremony, traditionally marking reaching the highest point of the building, was attended by the UCL Provost, Professor Michael Arthur, the Dean of The Bartlett, Professor Alan Penn and guests from GA, Hawkins\Brown, and students from The Bartlett School of Architecture. Professor Bob Sheil, Director of The Bartlett School of Architecture, said: "Being able to celebrate the topping out of 22 Gordon Street with the project team and student representatives from across the School is a fantastic moment. The building has hosted many spectacular events, visitors and projects over the years. The prospect of having more space and better facilities is very exciting. We can’t wait to move in and begin a new era of this highly distinguished School." The £30 million refurbishment and extension, carried out as part of UCL's Bloomsbury Campus Refurbishments project, will provide additional space and a completely new environment and home for The Bartlett School of Architecture. The new building will have additional floors, an expansion to the south side of the building, brand new studios, new social and cafe areas, a contemporary exhibition space and expanded workshops. Work on 22 Gordon Street will be completed in the summer of 2016 and all staff and students are expected to move back into the building for the beginning of the 2016/17 academic year. An official Opening Party is planned for December 2016 as part of the School's Bartlett 175 celebrations.